If you believe you need a tummy tuck, finding the right person with the right expertise is critical. Dr Michael Yunaev is very much that person. Alana was blessed with a blossoming career, a wonderful husband, two great kids and everything was in pretty good shape apart from her tummy. Two pregnancies had left her with a hernia in her belly button, abdominal muscle separation and excess lower abdominal skin. She had done the hard yards trying to get her old body back after pregnancies and weight fluctuations, but no matter what she did, she couldn’t fix the problems in her abdomen. This became a big a drag on the self-confidence and self-image of an attractive young woman in her early thirties so she decided to get herself back into shape. Alana undertook detailed research into the surgery she was facing and discovered it would be a tummy tuck. Then she identified the leading practitioners in that field. She had already determined that the restoration of her figure was a project of such vital importance that nothing less than the best would do. Cheap operations overseas didn’t even make it to the starting line. Her research identified three leading surgeons in Australia as the contenders to carry out her procedure and then she embarked on a programme to select the winner. At her first meeting with Dr Michael Yunaev she found herself surprisingly at ease and impressed by the way he assuaged her concerns. “He seemed instinctively to understand my feelings” said Alana. Nevertheless, she stuck to her plan and evaluated the other surgeons on her list before choosing Dr Michael. She even had two further meetings with him and took her husband along to one of them. “In the final analysis, it seemed he had the best qualifications and understood my needs better than the others” explained Alana. Dr Michael describes the tummy tuck procedure as body contouring. It is comprised of removal of excess abdominal skin and fibrotic hard-to-shake fat from the lower abdomen, as well as correction of abdominal hernias and functional re-alignment of the rectus muscles to give a proper support to the abdomen and its contents. Women may require the procedure after adverse effects from pregnancies or following significant weight loss. Alana required attention to all three components of this surgery. That combination of procedures requires a stay in hospital of three to five days. After a further two to three days she was reasonably mobile and lost all soreness after two and a half months. During that period she texted Dr Michael a number of times about issues arising. She was very appreciative of his prompt responses even when he was on holiday. Alana couldn’t be more delighted with the outcome of Dr Michael’s work. She’s got her tummy, her femininity and her mojo back and she rates her new waistline as an improvement on the original design. Alana’s advice to women considering a tummy tuck is do it sooner rather than later, find out as much as you can about tummy tucks and the leading practitioners, don’t even consider risking cheaper options overseas and just choose the best option at home. Alana is confident that in Dr Michael she made the right choice and would recommend him without hesitation, but stresses that in her view it is vital for peace of mind that every woman decides for herself. 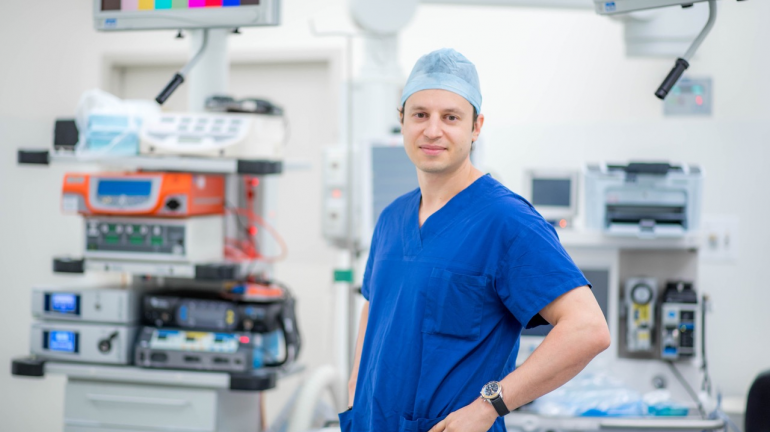 Dr Michael Yunaev is a Specialist Oncoplastic and Cosmetic Breast and General Surgeon and is the Principal Surgeon at the Breast and Body Clinic. He can be contacted on (02) 9819 7449 or online at www.bbclinic.com.au. Regina his Practice Manager is especially understanding and helpful. He is available for consultations at The Chris O’Brien Lifehouse Camperdown, St Lukes Clinic at Potts Point, Norwest Private Hospital at Bella Vista and St Jude Street Specialist Centre at Bowral.